We are a family business, and not just in the sense that Andrew and I are a husband and wife running a business, but because we are a family who truly cares about you and your family. It doesn’t matter whether you are a single college student or married parents of six, we care about you and the people you care about. Andrew, myself, and our team have had a variety of experiences that help us to empathize with where you are. We understand busy lives of all forms, and want to serve you so that you have safe transportation to get where you need to go. When it all began, Andrew did pretty much everything – administration, mechanical work, estimating, ordering, making business decisions, marketing, etc. Now we have a full-time office manager, a part-time diagnostics tech, and me juggling a baby, marketing and staff care. Andrew is able to stay out in the shop focusing on customers cars and the rest of us keep everything else running so the shop can continue to grow and serve our customers well. We all have families we are providing for and we’re becoming part of each other’s families, so we see the value in each person who brings in their vehicle for service. They have a job and/or school, family (maybe even a spouse and children), and a community they care about. We get that life is crazy. Before we owned a business and became parents, we were students, busy single young adults, and young marrieds who were trying to build a career. We’ve made a lot of tough decisions and continue to do so while trying to incorporate a family into our business. 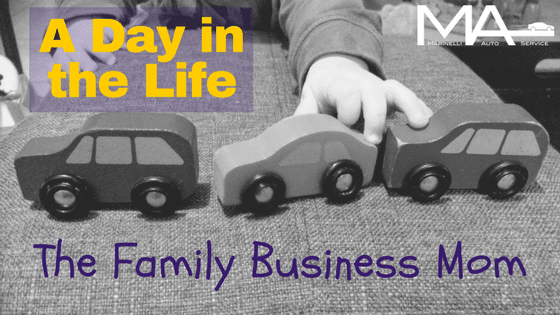 As our business grows and our family grows with it, every day continues to be full of hectic decisions, and every day our business looks different for each of us. As a new mom, my role as Community Engagement Director and Staff Care Coordinator is particularly unique. A day in my life? After a bustling morning of breakfast, multiple wardrobe changes, diaper changes and coffee (yay coffee! ), I do a happy dance. “Yes! The baby is sleeping!” I run to my computer, pick up the phone, and settle in to get some work done. I check in with the shop. “What’s going on today? What are the biggest needs?” Ok. A car, a truck, a question. Good, I can do that. I work for a bit and then I hear rustling upstairs. I head up to the nursery and am greeted by a big smile of a well-napped little boy. We have a bottle with one hand while I respond to emails with the other. When he’s done eating, I change his diaper and his clothes and pack a bag to go out for the rest of the day. We arrive at a meeting for the chamber of commerce and everyone oohs and awws over my son. It’s definitely a bonus to have him with me, generally being rather shy when I meet someone for the first time, he makes it easy to break the ice. The conversation eventually turns to what business we are there representing. Business cards are exchanged. I hear stories of when the other attendees’ kids were little or of their grandkids. We set up a time to meet one-on-one at a later date – much of the time they offer to come to my house so that it’s easier for me as a stay-at-home-working-mom. We swing by the shop on our way home to pick up a bank deposit or drop off something for Andrew and tell him about our son’s latest accomplishment before we head home. We rush through the door so I can feed the baby again and get him down for his afternoon nap. I get a chore or two done in the house before grabbing my computer again, exhausted toward the end of a busy day but feeling accomplished. Even now, as I bear down to finish writing this blog post, my mind is multitasking. I’m running my shopping list through my mind, planning my errand route so I can stop to check in at the shop and bring Andrew some lunch, and thinking about what I need to run our next staff meeting. The baby monitor is lighting up and I hear rustling noises. As important as my work is, I’m grateful for the opportunity to enjoy a break playing with our quickly growing little boy.